For other people with the same name, see Calvin Johnson (disambiguation). Calvin Johnson Jr. (born September 29, 1985) is a former American football wide receiver who is widely regarded as one of the greatest wide receivers of all time despite his early retirement at age 30 in 2016. A two-time All-American at Georgia Tech, Johnson was selected second overall by the Detroit Lions of the National Football League in the 2007 NFL Draft, and he played for the Lions for all of his professional career. On March 14, 2012, Johnson signed an eight-year, $132 million contract extension with the Lions, one of the largest sports contracts ever. Johnson had a rare combination of size (6 ft 5 in and 239 lbs), catching ability, speed (40-yard dash in 4.35 seconds), strength, leaping ability, and body control. He was nicknamed Megatron, after a Transformers character; the name was given to him by Lions teammate Roy Williams and caught on with fans. On December 22, 2012, Johnson broke Jerry Rice's single-season record of 1,848 receiving yards, and finished the 2012 season with 1,964 yards, an average of almost 123 yards per game. In that same game versus the Atlanta Falcons, Johnson also set the NFL records for consecutive 100-yard games (8, later tied by Adam Thielen) and consecutive games with 10 or more receptions (4). He tied Michael Irvin's record for most 100-yard games in a season with 11. Johnson was born to Calvin and Arica Johnson on September 29, 1985, in Newnan, Georgia. Johnson was 6 feet tall in middle school, and 6 feet 4 inches in 10th grade. He attended Sandy Creek High School in Tyrone, Georgia and was a student, a letterman in football, and a baseball standout. In football, he was a three-year starter as a wide receiver for the Patriots football team. As a sophomore, he made 34 receptions for 646 yards and 10 touchdowns. As a junior, Johnson caught 40 passes for 736 yards and eight touchdowns. His #81 was retired on October 22, 2010. Johnson was rated among the nation's top 10 wide receivers and top 100 players by virtually every recruiting analyst. He was tabbed the No. 4 wide receiver and No. 15 player in the nation by TheInsiders.com, and named to the Super Southern 100 by the Atlanta Journal-Constitution, the Rivals 100 by Rivals.com, TheInsiders.com Hot 100, the SuperPrep All-America 275, and the Prep Star Top 100 Dream Team. Johnson was also rated as the best player in Georgia, No. 12 in the Southeast and No. 37 in the nation by Rivals.com, the No. 7 wide receiver in the nation by SuperPrep, and first-team all-state selection (Class AAAA) by the Atlanta Journal-Constitution. Finally, he was tabbed to the AJC's preseason Super 11. By the time he was a junior, he was ranked as within the top 10 wide receivers and the top 100 players in the nation by almost every writer. "2004 Georgia Tech Football Commitment List". Rivals.com. Retrieved August 17, 2013. "2004 Georgia Tech College Football Team Recruiting Prospects". Scout.com. Retrieved August 17, 2013. "2004 Team Ranking". Rivals.com. Retrieved August 17, 2013. Johnson attended the Georgia Institute of Technology, where he played for head coach Chan Gailey's Georgia Tech Yellow Jackets football team from 2004 to 2006. Despite Georgia Tech being interested in his playing both football and baseball, Johnson's mother refused to allow Johnson to play both sports after determining that the year-round athletic schedule would be too demanding. In his career at Georgia Tech wearing #21, Johnson made a case for being the greatest Georgia Tech player of all time. Johnson had 178 receptions in his career, good for 2,927 yards and 28 touchdowns. He ranks first in school history in career receiving yards, second in receptions, first in touchdown receptions, and first in career 100-yard receiving games with 13. As a freshman in 2004, Johnson was a first-team All-Atlantic Coast Conference (ACC) selection. Johnson was the Jackets' leading receiver with 48 catches for 837 yards and seven scores, which were Georgia Tech freshman records. Johnson ended his freshman campaign against Syracuse in the 2004 Champs Sports Bowl, where he recorded a touchdown. 2005 was Johnson's sophomore year, when he earned first-team All-American honors. He also earned All-ACC honors for the second straight year and was a semifinalist for the Fred Biletnikoff Award. He led Tech with 54 catches for 888 yards and six touchdowns. Johnson entered his 2006 junior season in the running for the Biletnikoff Award and Heisman Trophy. 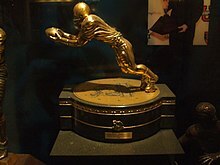 Although Johnson finished tenth in the Heisman voting, he won the Biletnikoff as the best college wide receiver. Johnson was honored as the ACC Player of the Year, was a first-team All-ACC selection for the third consecutive year, and was recognized as a unanimous first-team All-American. Johnson tallied 1,202 yards on 76 catches. 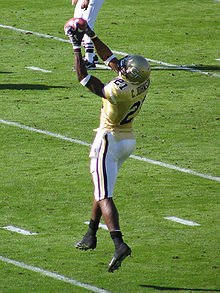 Johnson's 15 touchdowns in 2006 was a new Georgia Tech single-season record. Against the West Virginia Mountaineers in the Toyota Gator Bowl, Johnson had nine catches for 186 yards and two touchdowns, albeit in a losing effort. During the summer of 2006, Johnson, who majored in management with a background in building construction, was given the option of working on either constructing environmentally friendly luxury condos, or a project building solar latrines to improve sanitation in Bolivia. Johnson chose the latter, as he wanted to help the less fortunate. The "solar latrines" use the sun's rays to safely transform bacteria-laden waste into fertilizer. Johnson was SI.com's Midseason 2007 NFL Draft Projection #1 pick, though Johnson had stated that he intended to earn his degree from Georgia Tech. On January 8, 2007, Johnson declared himself eligible for the NFL Draft, bypassing his senior season at Georgia Tech. He was regarded as the best athlete to come out of the draft and was the #1 player on most draft boards. Johnson was said by ESPN to be able to be productive as a rookie, much like receiver Randy Moss was as a rookie. In a mid-February workout with speed and conditioning coach Mark Pearsall, Johnson clocked a 4.33-second 40-yard dash, recorded an 11-foot standing broad jump, and had a vertical leap of 43 inches. Johnson surprised many when he weighed in at 239 pounds at the combine although he claims that this season he played "at about 235 and I got up to 238" and that his weight was not a problem. Johnson had told the media that he would not run the 40-yard dash at the combine but would wait until his March 15 workout at Georgia Tech. Johnson ran a 4.35 and wowed scouts with his jump drill results, his receiving skills, and his 11 ft 7 in (3.53 m) broad jump, which is "best broad jump I can ever remember an NFL prospect having," according to Gil Brandt. Johnson is the only player 6-foot-5 or taller, regardless of position, to run a 40-yard dash in under 4.40 seconds at the combine since 2006. Johnson was selected by the Detroit Lions in the first round as the second pick overall in the 2007 NFL Draft. This is the highest a Georgia Tech Yellow Jacket has ever been drafted. The Lions were expected to trade Johnson, most likely to the Tampa Bay Buccaneers, but the team announced that they were keeping him. The next day, the Detroit Tigers invited him to throw out the ceremonial first pitch. Johnson attended Reebok's NFL Rookie Premiere in Los Angeles. The Lions, being told by the league that Johnson would have to skip the minicamp to attend, rescheduled the camp to accommodate Johnson. On August 3, 2007, Johnson signed a six-year deal with the Detroit Lions after holding out for eight days, and passed his physical in time to be on the field for the start of that morning's practice. He was represented by agent James "Bus" Cook. The contract was worth up to US$64 million, with $ in guaranteed money, making Johnson the highest-paid player in Lions history (since passed by quarterback Matthew Stafford and defensive tackle Ndamukong Suh) and the highest-paid receiver (in guaranteed money) in the NFL. Although he did not start the game, Johnson had an impressive NFL debut on Sunday, September 9, 2007, catching four passes for 70 yards and his first career touchdown in Detroit's 36–21 win over the Oakland Raiders. He sustained a lower back injury after making a catch over two Philadelphia Eagles defenders on September 23, 2007. He scored his first NFL rushing touchdown against the Tampa Bay Buccaneers on October 21, 2007 on a 32-yard reverse play. Fellow teammate and wide receiver Roy Williams nicknamed Johnson "Megatron", due to his large hands being similar to that of the towering Decepticon. The nickname caught on well with fans. Williams later changed the nickname to "Bolt" after Jamaican sprinting phenom Usain Bolt, comparing the two athletes' similar height and running abilities. Johnson finished the 2007 season with 756 yards and five total touchdowns. In 2008, Johnson said he could "still feel" the lower-back injury that bothered him throughout his rookie season. Johnson took five weeks off after the 2007 season and was taking part in the Lions' offseason program. "I know it's there but it doesn't hurt," he said. Johnson revealed that he needed Vicodin to play through the final three months of the 2007 season. He needed the medication to help him play with a bone bruise in his back. "I was on meds the rest of the season," he said. "I was taking Vicodin twice a game just to get through the game. I stayed hurt the whole season, probably because I was trying to come back too soon." Johnson averaged 15.8 yards on 48 catches in the 2007 season. Johnson and the Lions faced the Atlanta Falcons on the road on September 7, 2008, in the season opener at the Georgia Dome. As the official starting wide receiver behind Roy Williams, Johnson led the team in receptions and yards, collecting seven catches for 107 yards, which included one 38-yard catch-and-run in the Lions' 34–21 loss. During Week 2 versus the Green Bay Packers, he had two key touchdowns late in the game, which sparked a large comeback, though the Lions eventually lost the game, 48–25. Both touchdowns catches included a run after the catch (the first catch going for 38 yards and the second going for 47 yards, both over the middle) displaying Johnson's speed and breakaway ability. He ended the game with six receptions for 129 yards and 2 touchdowns. In the following two games, losses to San Francisco and Chicago, Johnson failed to score a touchdown or gain over 50 yards receiving. However, against the Minnesota Vikings, Johnson had four receptions for 85 yards and his third touchdown of the season. On October 14, before the Week 6 trade deadline, Roy Williams was traded to the Dallas Cowboys for a first, a third and a seventh-round pick in the 2009 NFL Draft, making Johnson the Lions' starting wide receiver and the last big threat on the offense. In his first game without Roy Williams alongside him in the Week 7 game against the Houston Texans, Johnson caught only two passes, totaling 154 yards receiving; the first pass did not come until quarterback Dan Orlovsky threw a pass up for grabs at the end of the first half which Johnson caught for 58 yards and the second pass came on a 96-yard touchdown catch-and-run. With Williams gone and starting quarterback Jon Kitna lost to injury for the season, the Texans defense had little to do to stop the Lions' offense but shut down Johnson, winning the game 28–21. Johnson set a career-high for receptions in a game during the Week-9 match-up against the Lions' division rivals, the Chicago Bears, with eight receptions that garnered 94 yards and one touchdown, but still lost the game 27–23. During Week 10, formerly retired All-Pro quarterback Daunte Culpepper was signed to a one-year contract with the Lions in hopes to spur the offense and earned the starting job for the next two games. Johnson ended his first game with Culpepper at quarterback with 2 receptions for 92 yards in a 38–14 loss to the Jacksonville Jaguars. In Johnson's fourth game with Culpepper, he had five catches for 66 yards. During the Week 14 match-up against the division rival Minnesota Vikings, Johnson passed the 1,000-yard receiving mark for the first time in his career after collecting three catches for 84 yards and one touchdown, ending the week with 1,055 yards receiving and nine touchdowns on the season. Johnson and the 2008 Detroit Lions finished the first ever 0–16 season in NFL history after a 31–21 loss to the Green Bay Packers in Week 17. Despite the Lions' failures and the fact that five different quarterbacks played during the year, Johnson finished as one of the strongest wide receivers statistically for the 2008 season, finishing fifth in receiving yards (1,331) and 7th in receiving yards per game (83.2), and leading the league in receiving touchdowns (12), despite the fact that the entire Lions team only passed for 18 touchdowns. However, Johnson missed the Pro Bowl, with most experts attributing the snub to the Lions' dismal winless season. After 2008, Detroit's front office and coaching personnel were essentially overhauled by the team ownership. Matt Millen, the team's incumbent general manager and CEO since 2001, was terminated on September 24, 2008. Head coach Rod Marinelli was fired in the offseason. Marinelli was replaced by Jim Schwartz, then defensive coordinator of the Tennessee Titans. Schwartz ultimately revamped the entire Detroit offensive (and defensive) philosophies‍—‌hiring Scott Linehan and Gunther Cunningham, respectively. Detroit held the first pick in the 2009 NFL Draft, and selected quarterback Matthew Stafford out of the University of Georgia. Stafford was named the team's starting quarterback out of training camp, but he battled various injuries throughout the season. 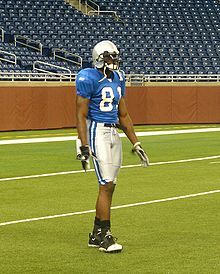 Much of the 2008 Detroit roster was released by the new regime, and the 2009 team was viewed as somewhat of a work-in-progress, but Johnson still finished the 2009 season with 67 receptions, 984 yards, and five touchdowns, while missing two games. In the season opener against the Chicago Bears, Johnson caught a pass with 31 seconds left in regulation in the end zone for what looked like a game-winning touchdown. However, referee Gene Steratore ruled the catch incomplete, saying that Johnson had not maintained possession of the ball through the entire process of the catch. The Lions lost the game by a score of 19–14. Johnson amassed 77 receptions for 1,120 yards and 12 touchdowns during the 2010 season. He was selected to the first Pro Bowl of his career. Following the 2010 season, Johnson was the recipient of the Lions/Detroit Sports Broadcasters Association/Pro Football Writers Association (Detroit Chapter) Media-Friendly Good Guy Award. In 2011, Johnson had his second best statistical season of his NFL career, reaching a career-high 1,681 receiving yards and 16 touchdowns. In Week 4 against the Dallas Cowboys, Johnson helped rally the Lions from a 24-point deficit to a 34–30 victory by catching two touchdown passes in the fourth quarter, including a famous catch in which Johnson beat the Cowboys' triple coverage in the end zone. This performance gave Johnson eight touchdown receptions through the first four games of the season and tied Cris Carter for most consecutive games with multiple touchdown receptions with four. In a Week 17 game against the Green Bay Packers, Johnson had a then career-best 244 receiving yards in a 45–41 loss. Johnson and the Lions clinched a playoff spot for the first time since 1999, and the first time in Johnson's career, after a 38–10 beating of the San Diego Chargers on Christmas Eve. However, Detroit would ultimately lose on the road against the Packers the following week on New Year's Day and would find themselves on the road again in a 2012 NFC Wild Card game against the heavily favored New Orleans Saints in the playoffs. Always tough to play against at the Superdome, the Saints wore down the Detroit defense and New Orleans would go on to a win by a score of 45–28. In the game, Johnson caught 12 passes for 211 receiving yards and two touchdowns‍—‌breaking Detroit's playoff record of 150 receiving yards in a playoff game previously held by Brett Perriman and Leonard Thompson. On March 14, 2012, Johnson signed an eight-year extension worth US$132 million with the Detroit Lions, with US$60 million guaranteed, making Johnson the highest-paid receiver in the league. Johnson beat out 42 other players and eliminated quarterback Cam Newton to win the Madden NFL 13 cover athlete on April 25, 2012, on SportsNation. Johnson started off the season with six receptions for 111 yards against the St. Louis Rams. In Week 3, against the Tennessee Titans, he had 10 receptions for 164 yards and a touchdown. In Week 6, against the Philadelphia Eagles, he had six receptions for 135 yards. In the stretch from Week 9 to Week 14, he recorded five consecutive games with 125 receiving yards or more, which tied the NFL record held by Pat Studstill. In that stretch were performances of 207 yards and a touchdown against the Minnesota Vikings and 171 yards and a touchdown against the Indianapolis Colts. On December 22, against the Atlanta Falcons, Johnson broke Jerry Rice's single-season receiving yards record of 1,848 yards. Johnson was also named a starter for the NFC in the Pro Bowl played in Honolulu, Hawaii. Johnson finished with 72 yards against the Chicago Bears in Week 17, missing out on 2,000 receiving yards by 36. Johnson finished the season leading the league in receptions (122) and receiving yards (1,964). Johnson became the only player in the Super Bowl era (since 1967) to average 120 yards per game in a season, when he averaged 122.8 yards per game in 2012. After a slow start to the 2013 season with only 37 receiving yards against the Minnesota Vikings, he had six receptions for 116 yards and two touchdowns against the Arizona Cardinals. In the following game, against the Washington Redskins, he had seven receptions for 115 receiving yards and a touchdown. In Week 7, against the Cincinnati Bengals, he had nine receptions for 155 yards and two receiving touchdowns. On October 27, in a 31–30 win over the Dallas Cowboys, Johnson caught 14 of 16 passes thrown in his direction; he finished the game with 329 receiving yards and one touchdown. In addition to breaking the Lions' franchise record of 302 receiving yards set by Cloyce Box on December 3, 1950, it was the highest receiving yardage ever in a regulation-length game and the second-highest overall single-game yardage in NFL history, behind Flipper Anderson's 336-yard performance in a 1989 overtime win (Anderson accumulated 40 of those yards in overtime). In this same game, Johnson tied Lance Alworth for the most career games with at least 200 yards receiving with five. In Week 10 against the Chicago Bears, Johnson had six receptions for 83 yards and two touchdown receptions. The second one gave him the Lions all-time record for touchdown catches with 63, breaking the old mark previously held by Herman Moore. In the following game, he had six receptions for 179 yards and two receiving touchdowns against the Pittsburgh Steelers. Ovearll, he finished the 2013 season with 84 receptions, 1,492 receiving yards, and 12 receiving touchdowns. Johnson was named to the 2014 Pro Bowl, but an injury forced him to withdraw. Johnson started the 2014 season off strong with seven receptions for 164 yards and two receiving touchdowns against the New York Giants. In Week 10, against the Miami Dolphins, he had seven receptions for 113 yards and a touchdown. On November 27, in the annual Thanksgiving Day game against the Chicago Bears, Johnson became the fastest player to reach 10,000 receiving yards in NFL history at the time, eclipsing the mark in the second quarter of his 115th game. Against the Bears, he had 11 receptions for 146 yards and two receiving touchdowns in the 34-17 victory. In the next game against the Tampa Bay Buccaneers, he had eight receptions for 158 yards and a receiving touchdown in the 34-17 victory. He closed the season out with four receptions for 39 yards and two receiving touchdowns against the Green Bay Packers. He was named to his fifth Pro Bowl in a row, the most by any Lion since Barry Sanders was named to ten consecutive Pro Bowls. He finished the 2014 season with 71 receptions for 1,044 yards and eight touchdowns. Much like Week 1 in Chicago five years back, in Week 4 at Seattle, Johnson was involved in another controversial play. This time, late in the fourth quarter, Seahawks safety Kam Chancellor punched the ball out of Johnson's hands while he was trying to score a late go-ahead touchdown. Linebacker K. J. Wright then batted the ball out of the end zone for a touchback. The NFL later admitted the referees should have penalized Wright for illegal batting. The Seahawks won the game by a score of 13–10. In Week 5, a 42-17 loss to the Arizona Cardinals, Johnson caught his 671st career pass, breaking Herman Moore's franchise record. In Week 6, Johnson caught six passes for 166 yards in an overtime victory over Chicago. This gave the Lions their first victory of the season after an 0–5 start. In Week 12, against the Philadelphia Eagles, Johnson caught eight passes for 93 yards and three touchdowns to help lead the Lions to their third straight victory and lift their record to 4–7. In Week 8 against the Kansas City Chiefs in the NFL International Series on November 1, Johnson became the fastest player to reach 11,000 receiving yards in NFL history, in his 127th game. Johnson finished the season with 88 receptions for 1,214 yards (13.8 average), and nine touchdowns, reaching 1,000-yards receiving for the sixth consecutive year, and seventh time in nine years. Johnson was named to the Pro Bowl for the sixth consecutive year, but he declined to attend. His 1,214 yards in the 2015 season are the most ever in a player's final season in the NFL, while his 88 receptions are the second most in a player's final season, trailing Sterling Sharpe's 94 receptions in the 1994 season. On March 8, 2016, Johnson announced his retirement from the NFL after nine seasons. His 11,619 receiving yards rank third in a player's first nine seasons, trailing only Torry Holt (11,864) and Jerry Rice (11,776). Since Johnson was drafted by the Lions with the second overall pick in the 2007 NFL Draft, no player has more receiving yards, receiving touchdowns, and 100-yard games (46) than Johnson through the 2015 season. His 5,137 receiving yards from 2011 to 2013 are the most by any player over a three-year stretch in NFL history. Most receiving yards in a single game in regulation (329). Johnson's 329 receiving yards are the 2nd most overall in NFL history behind Flipper Anderson (336). On August 30, 2016, Johnson was announced as one of the celebrities who would compete on season 23 of Dancing with the Stars. He was partnered with professional dancer Lindsay Arnold. He finished in third place to James Hinchcliffe and Laurie Hernandez. 7 Jive / "Good Golly, Miss Molly"
8 Quickstep / "Dr. Bones"
Semifinals Tango / "Seven Nation Army"
Finals Viennese Waltz / "I Am Your Man"
Freestyle / "Please Mr. Postman" & "I Want You Back"
Johnson became engaged to long-time girlfriend Brittney McNorton in March 2015. They were married in June 2016. The couple currently resides in Atlanta. He has a son from a previous relationship. Johnson is a Christian. Johnson has a tattoo of the crucifixion of Jesus on his left arm and a Christian cross on his right arm. Johnson was part of a weekly Bible study group with other Lions players. In February 2019, Johnson and his wife Brittney were granted preliminary approval to open a medical cannabis dispensary in Michigan. ^ "Calvin Johnson". NFL.com. NFL Enterprises LLC. Retrieved April 18, 2017. ^ Harrison, Elliot (March 8, 2016). "Ten best receivers of all time". nfl.com. ^ "Calvin Johnson signs $132M deal". ESPN. March 14, 2012. Retrieved October 29, 2013. ^ a b c d Clayton, John (February 26, 2007). "Johnson impresses at combine". ESPN. Retrieved March 4, 2019. ^ a b c d e f g h i j k "Calvin Johnson's Georgia Tech profile". RamblinWreck.com. Georgia Tech Athletic Association. Retrieved February 18, 2007. ^ "Jerry Rice's single-season record falls to Calvin Johnson". Pro Football Talk. December 23, 2012. Retrieved December 23, 2012. ^ "Calvin Johnson Stats – Detroit Lions – ESPN". Retrieved January 27, 2015. ^ "Calvin Johnson breaks NFL record for consecutive 100-yard games". Pro Football Talk. December 23, 2012. Retrieved December 23, 2012. 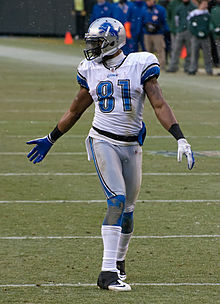 ^ "Calvin Johnson | #81 | WR". NFL. Retrieved December 30, 2010. ^ Glier, Ray (August 28, 2006). "Georgia Tech's star receiver just can't miss". USA Today. Retrieved September 17, 2007. ^ "Freshman Faces in the Crowd". The Technique. September 24, 2004. Archived from the original on October 29, 2004. Retrieved May 17, 2007. ^ GHSF Daily (October 22, 2010). "Sandy Creek to retire Calvin Johnson's number". The Atlanta Journal-Constitution. Archived from the original on October 29, 2013. Retrieved October 11, 2011. ^ Battista, Judy (April 26, 2007). "Johnson Has No Baggage and a Seat in First Class". The New York Times. Retrieved January 30, 2016. ^ a b "Johnson to Enter NFL Draft". RamblinWreck.com. January 8, 2007. Retrieved February 18, 2007. ^ "Calvin Johnson 2004 Game Log". College Football at Sports-Reference.com. Retrieved March 2, 2019. ^ "Champs Sports Bowl - Syracuse vs Georgia Tech Box Score, December 21, 2004". College Football at Sports-Reference.com. Retrieved March 2, 2019. ^ "Calvin Johnson 2005 Game Log". College Football at Sports-Reference.com. Retrieved March 2, 2019. ^ "2006 Heisman Trophy Voting". College Football at Sports-Reference.com. Retrieved March 2, 2019. ^ "Fred Biletnikoff Award Winners". College Football at Sports-Reference.com. Retrieved March 2, 2019. ^ "Calvin Johnson 2006 Game Log". College Football at Sports-Reference.com. Retrieved March 2, 2019. ^ "ACC Offensive Player of the Year Winners". College Football at Sports-Reference.com. Retrieved March 2, 2019. ^ "ACC Player of the Year Winners". College Football at Sports-Reference.com. Retrieved March 2, 2019. ^ "ACC Leaders". NCAASports.com. Retrieved February 18, 2007. ^ "Consensus All-America Teams (2000-2009)". College Football at Sports-Reference.com. Retrieved March 2, 2019. ^ Finder, Chuck (December 30, 2006). "Gator Bowl: Georgia Tech receiver is tops". Pittsburgh Post-Gazette. Archived from the original on September 29, 2007. Retrieved August 10, 2007. ^ Kiper, Mel (January 1, 2007). "West Virginia vs. Georgia Tech: ESPN's Take". ESPN. Retrieved August 10, 2007. ^ "Georgia Tech Yellow Jackets Receiving". College Football at Sports-Reference.com. Retrieved March 2, 2019. ^ a b c d "Lions Sign First-Round Draft Pick WR Calvin Johnson". Detroit Lions. August 3, 2007. Retrieved August 25, 2007. ^ "2006 Heisman Trophy Voting". Sports Reference. Retrieved December 25, 2011. ^ "Calvin Johnson Selected for Induction to College Football Hall of Fame". RamblinWreck.com. Retrieved January 19, 2018. ^ Kantheti, Usha (September 22, 2006). "Playing locally, serving globally". The Technique. Archived from the original on October 24, 2007. Retrieved December 25, 2011. ^ "Students work to improve sanitation in developing countries". The Whistle. Georgia Tech Institute Communications and Public Affairs. August 5, 2006. Retrieved May 31, 2008. ^ "Appropriate Technology Design Team". Georgia Tech Cyberbuzz. Archived from the original on January 15, 2009. Retrieved December 25, 2011. ^ "NFL Midseason Draft Projection: #1, Calvin Johnson". Sports Illustrated. Archived from the original on February 7, 2007. Retrieved February 18, 2007. ^ Heerji, Asif (January 19, 2007). "Johnson chooses NFL". The Technique. Archived from the original on September 29, 2007. Retrieved February 18, 2007. ^ "Mel Kiper's Big Board". ESPN. Retrieved February 18, 2007. ^ Horwedel, Chris (March 13, 2007). "Top 200 Prospects". NFL Draft Blitz. Archived from the original on March 17, 2007. Retrieved March 19, 2007. ^ Stroud, Rick (February 14, 2007). "Georgia Tech's Johnson seen as a can't-miss WR". St. Petersburg Times. Retrieved February 18, 2007. ^ Newberry, Paul (February 28, 2007). "Calvin Johnson believes he's the best player in the NFL draft". Yahoo Sports. Associated Press. Archived from the original on March 12, 2007. Retrieved March 8, 2007. ^ Brandt, Gil. "Individual Workouts". NFL.com. Archived from the original on March 16, 2007. Retrieved March 21, 2007. ^ a b "Johnson Goes to Detroit with No. 2 Pick". RamblinWreck.com. Georgia Tech Alumni Association. April 28, 2007. Retrieved April 29, 2007. ^ Householder, Mike (April 29, 2007). "Lions Go On Offense With WR Johnson, QB Stanton". Fox 2 News Detroit. Archived from the original on September 28, 2007. Retrieved April 29, 2007. ^ Cotsonika, Nicholas (April 29, 2007). "Lions' catch is definite keeper". freep.com. Detroit Free Press. Archived from the original on September 29, 2007. Retrieved April 29, 2007. ^ "Top 10 Draft Surprises: The Lions don't trade Calvin Johnson". Sports Illustrated. April 29, 2007. Archived from the original on May 9, 2007. Retrieved April 30, 2007. ^ "Lions' draft pick wide receiver Calvin Johnson on team cam". NFL.com. April 29, 2007. Archived from the original on July 3, 2007. Retrieved April 30, 2007. ^ Kowalski, Tom (April 29, 2007). "Calvin Johnson to throw first pitch at Tigers game". Lions Insider. Retrieved May 5, 2007. ^ Pasquarelli, Len. "ESPN – Dungy concerned about rookies missing minicamp – NFL". ESPN. Retrieved August 28, 2008. ^ Smith, Michael David (May 20, 2007). "Lions Move Minicamp So Calvin Johnson Can Participate". The Fanhouse. AOL Sports. Retrieved May 21, 2007. ^ a b Cotsonika, Nicholas (August 3, 2007). "Lions sign WR Calvin Johnson". Detroit Free Press. Archived from the original on September 29, 2007. Retrieved August 3, 2007. ^ "Lions confirm Ndamukong Suh deal". ESPN. August 5, 2010. Retrieved August 5, 2010. ^ Hummer, Steve (September 10, 2007). "Johnson takes it all in stride in Lions debut". Atlanta Journal-Constitution. Archived from the original on September 10, 2007. Retrieved September 11, 2007. ^ VanOchten, Brian (September 9, 2007). "Williams saves TD ball for Johnson". The Grand Rapids Press. mlive.com. Retrieved September 11, 2007. ^ Cotsonika, Nicholas J (September 9, 2007). "Lion Calvin Johnson focuses on the game, rookie of the year, not the hype". Detroit Free Press. freep.com. Archived from the original on October 24, 2007. Retrieved September 11, 2007. ^ Associated Press (September 24, 2007). "Lions check themselves after blowout loss in Philadelphia". mlive.com. Retrieved September 24, 2007. ^ "Quick Take: Lions capitalize on Bucs' errors". NFL Game Center. nfl.com. October 21, 2007. Retrieved October 21, 2007. ^ "Calvin Johnson shows why Lions made him No. 2 pick in the draft". Associated Press. October 22, 2007. ^ "Lions atwitter over Seahawk Richard Sherman's new handle". Seattle Times. October 22, 2012. Retrieved November 30, 2014. ^ Kowalski, Tom (August 21, 2007). "Lions' Williams not jealous of Calvin Johnson". mlive.com. Retrieved September 3, 2008. ^ a b c "Calvin Johnson, WR for the Detroit Lions". NFL.com. Retrieved December 27, 2011. ^ "Lions' Johnson: Back injury lingered all season". mlive.com. April 20, 2008. Retrieved May 31, 2008. ^ "Calvin Johnson ready for big numbers". mlive.com. April 20, 2008. Archived from the original on June 21, 2008. Retrieved May 31, 2008. ^ "Detroit Lions at Atlanta Falcons - September 7th, 2008". Pro-Football-Reference.com. Retrieved March 2, 2019. ^ "Lions first NFL team to finish 0-16". ESPN. December 28, 2008. Retrieved December 27, 2011. ^ "Detroit Lions at San Francisco 49ers - September 21st, 2008". Pro-Football-Reference.com. Retrieved March 2, 2019. ^ "Chicago Bears at Detroit Lions - October 5th, 2008". Pro-Football-Reference.com. Retrieved March 2, 2019. ^ Yuille, Sean (October 15, 2008). "More on the Roy Williams Trade". Pride of Detroit. Retrieved October 22, 2008. ^ Duncan, Chris (October 20, 2008). "Texans' Johnson leads Houston past winless Detroit". Chicago Tribune. Archived from the original on January 13, 2009. Retrieved October 22, 2008. ^ "Detroit Lions at Chicago Bears - November 2nd, 2008". Pro-Football-Reference.com. Retrieved March 2, 2019. ^ "Jacksonville Jaguars at Detroit Lions - November 9th, 2008". Pro-Football-Reference.com. Retrieved March 2, 2019. ^ "Minnesota Vikings at Detroit Lions - December 7th, 2008". Pro-Football-Reference.com. Retrieved March 2, 2019. ^ Samuelsen, Jamie (December 17, 2008). "Lions' Pro Bowl snub isn't all that surprising". Detroit Free Pres. Archived from the original on October 5, 2012. Retrieved March 14, 2018. ^ Kowalski, Tom (September 24, 2008). "Millen fired, Lions to go through 'a comprehensive evaluation' in offseason". MLive. Retrieved March 14, 2018. ^ "Lions turn to Schwartz as coach". ESPN.com. January 16, 2009. Retrieved March 14, 2018. ^ "Marinelli fired after historic 0-16 season". ESPN.com. December 29, 2008. Retrieved March 14, 2018. ^ "2009 Detroit Lions Coaching Staff". Detroit Lions. February 11, 2009. Archived from the original on March 7, 2009. Retrieved March 14, 2018. ^ "Georgia's Stafford goes first overall". ESPN.com. April 26, 2009. Retrieved March 14, 2018. ^ Seligman, Andrew (September 12, 2010). "Bears escape Lions, but not without controversy". NBC Sports. Associated Press. Archived from the original on November 15, 2010. Retrieved September 29, 2011. ^ "Calvin Johnson 2010 Game Log". Pro-Football-Reference.com. Retrieved March 2, 2019. ^ "2011 Pro Bowl rosters". NFL.com. December 28, 2010. Retrieved September 29, 2011. ^ "Calvin Johnson 2011 Game Log". Pro-Football-Reference.com. Retrieved March 2, 2019. ^ a b "Lions stay unbeaten as turnovers, Calvin Johnson-fueled rally bury Cowboys". ESPN. Associated Press. October 2, 2011. Retrieved November 13, 2011. ^ "Matt Stafford leads 4th quarter rally as Lions take down Raiders". ESPN. December 18, 2011. Retrieved December 19, 2011. ^ "Lions bounce Chargers in romp to clinch 1st playoff berth since 1999". ESPN. December 24, 2011. Retrieved December 25, 2011. ^ "Wild Card - Detroit Lions at New Orleans Saints - January 7th, 2012". Pro-Football-Reference.com. Retrieved March 2, 2019. ^ Pasche, Paula (March 8, 2016). "Detroit Lions — Eighteen things to know about Calvin Johnson's career". The Oakland Press. Retrieved March 14, 2018. ^ "St. Louis Rams at Detroit Lions - September 9th, 2012". Pro-Football-Reference.com. Retrieved March 19, 2019. ^ "Detroit Lions at Tennessee Titans - September 23rd, 2012". Pro-Football-Reference.com. Retrieved March 19, 2019. ^ "Detroit Lions at Philadelphia Eagles - October 14th, 2012". Pro-Football-Reference.com. Retrieved March 19, 2019. ^ Hoffman, Benjamin (December 3, 2012). "Lions' Calvin Johnson Defies Description". The New York Times. Retrieved March 19, 2019. ^ "Detroit Lions at Minnesota Vikings - November 11th, 2012". Pro-Football-Reference.com. Retrieved March 19, 2019. ^ "Indianapolis Colts at Detroit Lions - December 2nd, 2012". Pro-Football-Reference.com. Retrieved March 19, 2019. ^ "Calvin Johnson sets single-season receiving yards record". National Football League. December 22, 2012. Retrieved December 22, 2012. ^ "2013 Pro Bowl rosters: AFC, NFC". ^ Trister, Noah (December 30, 2012). "Bears Beat Lions 26-24 But Miss Playoffs". The Huffington Post. Retrieved December 30, 2012. ^ a b "Calvin Johnson retires from the National Football League". March 8, 2016. Retrieved March 8, 2016. ^ "Minnesota Vikings at Detroit Lions - September 8th, 2013". Pro-Football-Reference.com. Retrieved March 19, 2019. ^ "Detroit Lions at Arizona Cardinals - September 15th, 2013". Pro-Football-Reference.com. Retrieved March 19, 2019. ^ "Detroit Lions at Washington Redskins - September 22nd, 2013". Pro-Football-Reference.com. Retrieved March 19, 2019. ^ "Cincinnati Bengals at Detroit Lions - October 20th, 2013". Pro-Football-Reference.com. Retrieved March 19, 2019. ^ "Dallas Cowboys at Detroit Lions - October 27th, 2013". Pro-Football-Reference.com. Retrieved March 2, 2019. ^ Rothstein, Michael (October 27, 2013). "Johnson's massive day lifts the Lions". ESPN. Retrieved October 29, 2013. ^ "Megatron breaks 300 yards as Lions rally for stunning win". CBS Sports. October 27, 2013. Retrieved October 29, 2013. ^ "Detroit Lions at Chicago Bears - November 10th, 2013". Pro-Football-Reference.com. Retrieved March 2, 2019. ^ Rogers, Justin (November 11, 2013). "Calvin Johnson passes Herman Moore for most touchdown receptions in Detroit Lions history". mlive.com. Retrieved March 19, 2019. ^ "Detroit Lions at Pittsburgh Steelers - November 17th, 2013". Pro-Football-Reference.com. Retrieved March 19, 2019. ^ Meinke, Kyle (January 7, 2014). "Detroit Lions awards: Calvin Johnson named offensive MVP". mlive.com. Retrieved March 19, 2019. ^ Wiederer, Dan (January 9, 2014). "Bears receiver Jeffery gets Pro Bowl invite". Chicago Tribune. Retrieved January 9, 2014. ^ "New York Giants at Detroit Lions - September 8th, 2014". Pro-Football-Reference.com. Retrieved March 19, 2019. ^ "Miami Dolphins at Detroit Lions - November 9th, 2014". Pro-Football-Reference.com. Retrieved March 19, 2019. ^ "Megatron fastest to 10,000 receiving yards". ESPN.com. November 27, 2014. Retrieved March 19, 2019. ^ "Chicago Bears at Detroit Lions - November 27th, 2014". Pro-Football-Reference.com. Retrieved March 19, 2019. ^ "Tampa Bay Buccaneers at Detroit Lions - December 7th, 2014". Pro-Football-Reference.com. Retrieved March 19, 2019. ^ "Detroit Lions at Green Bay Packers - December 28th, 2014". Pro-Football-Reference.com. Retrieved March 19, 2019. ^ Trister, Noah (November 27, 2014). "Johnson shines in Detroit's 34-17 win over Chicago". CBS Sports. Retrieved December 1, 2014. ^ "Calvin Johnson 2014 Game Log". Pro-Football-Reference.com. Retrieved March 2, 2019. ^ Sherman, Rodger (October 5, 2015). "Calvin Johnson fumbles on the 1-yard line". SBNation.com. Retrieved March 19, 2019. ^ Zeigler, Cyd (October 5, 2015). "Refs screw up key call at end of Lions-Seahawks". SBNation.com. Retrieved March 19, 2019. ^ Crabtree, Curtis (October 6, 2015). "Kam Chancellor forces fumble of Calvin Johnson, saves Seahawks in win over Lions". ProFootballTalk. Retrieved March 19, 2019. ^ "Detroit Lions at Seattle Seahawks - October 5th, 2015". Pro-Football-Reference.com. Retrieved March 2, 2019. ^ "Calvin Johnson surpasses Herman Moore for career receptions". Detroit Lions. Retrieved March 19, 2019. ^ "Arizona Cardinals at Detroit Lions - October 11th, 2015". Pro-Football-Reference.com. Retrieved March 2, 2019. ^ "Chicago Bears at Detroit Lions - October 18th, 2015". Pro-Football-Reference.com. Retrieved March 2, 2019. ^ "Philadelphia Eagles at Detroit Lions - November 26th, 2015". Pro-Football-Reference.com. Retrieved March 2, 2019. ^ a b Rothstein, Michael (November 1, 2015). "Calvin Johnson hits 11,000 receiving yards in record time in bad offense". ESPN. Retrieved November 1, 2015. ^ Meinke, Kyle (December 21, 2015). "Lions WR Calvin Johnson reaches 1,000 yards receiving for sixth straight season". MLive. Retrieved December 21, 2015. ^ Twentyman, Tim (December 22, 2015). "Two Lions named to 2016 Pro Bowl". Detroit Lions. Retrieved December 22, 2015. ^ Birkett, Dave (March 8, 2016). "Detroit Lions' Calvin Johnson is retiring and is 'at peace with it'". Detroit Free Press. Retrieved March 8, 2016. ^ DaSilva, Cameron (March 8, 2016). "The 10 craziest stats from Calvin Johnson's illustrious career". Fox Sports. Retrieved March 8, 2016. ^ a b "Falcons clinch NFC's No. 1 seed; Calvin Johnson breaks receiving record". ESPN. Associated Press. December 12, 2012. Retrieved December 12, 2012. ^ "Calvin Johnson breaks record". ESPN. Associated Press. December 12, 2012. Retrieved December 12, 2012. ^ Seifert, Kevin (December 12, 2012). "Calvin Johnson: 117 yards down, 65 to go". ESPN.com. ESPN. Retrieved December 12, 2012. ^ Smith, Michael David (December 22, 2012). "Calvin Johnson breaks NFL record for consecutive 100-yard games". Profootballtalk. Retrieved December 22, 2012. ^ "Calvin Johnson has the most receiving yards in a 5 game span ever". NFL Draft Diamonds. Archived from the original on December 3, 2013. Retrieved November 25, 2015. ^ Rank, Adam. "Eli Manning returns to San Diego, jeering ensues". NFL.com. Retrieved November 25, 2015. ^ a b "Detroit Lions Receiving Single-Season Register". Pro Football Reference. Retrieved February 3, 2012. ^ a b c d "Detroit Lions Receiving Records". Detroit Lions. Archived from the original on January 8, 2013. Retrieved March 8, 2016. ^ a b Rothstein, Michael (September 15, 2013). "Calvin Johnson sets two franchise records". ESPN. Retrieved October 29, 2013. ^ Patra, Kevin (October 28, 2013). "Calvin Johnson has historical game for Detroit Lions". NFL.com. Retrieved August 2, 2014. ^ Niyo, John (October 28, 2013). "Calvin Johnson proves once again there's no other receiver like him". The Detroit News. Archived from the original on August 8, 2014. Retrieved August 2, 2014. ^ Chiari, Mike. "Calvin Johnson, Ryan Lochte Among Athletes of 2016 'Dancing with the Stars' Cast". Bleacher Report. Retrieved March 19, 2019. ^ "Calvin Johnson finishes third on 'Dancing with the Stars'". Detroit Free Press. Retrieved March 19, 2019. ^ Manzullo, Brian. "Ex-Lions WR Calvin Johnson is getting married Saturday". Detroit Free Press. Retrieved March 19, 2019. ^ "Former Lions wideout Calvin Johnson reveals wife is expecting". Detroit Lions. Retrieved March 19, 2019. ^ "SUNDAY'S BEST: THE MOST INTERESTING TATTOOS IN SPORTS! PART 2". Archived from the original on February 18, 2015. Retrieved April 21, 2014. ^ "Strength in Numbers: Calvin Johnson". YouTube.com. Retrieved March 19, 2019. ^ "Calvin Johnson, Detroit Lions". Fellowship of Christian Athletes. Retrieved March 19, 2019. ^ LeBlanc, Beth (February 21, 2019). "Calvin Johnson wins preliminary approval for medical pot shop". The Detroit News. Retrieved March 4, 2019. ^ Biolchini, Amy (February 21, 2019). "Former Detroit Lion Calvin Johnson gets thumbs up for Michigan marijuana shop". MLive. Retrieved March 4, 2019. Wikimedia Commons has media related to Calvin Johnson.